The Swift™ FX for Her Nasal Pillows Mask delivers all the comfort of our groundbreaking Swift FX™ in a female-friendly design. 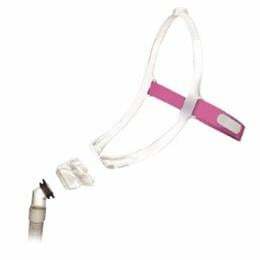 With its petite size and low level of facial coverage, the Swift™ FX for Her was created to accommodate the slightly smaller facial contours of female patients. The mask’s minimal design creates a feeling of freedom, and its stylish colors and petite frame make therapy less intimidating and easier to accept for sleep apnea patients.